It all started with a question in an old issue of Pointe magazine: “I feel bad sending all of my dead pointe shoes to a landfill. Is there any way to recycle them?” When Katarina Jakimier read the answer—“Currently, there are no specific pointe shoe recycling programs”—her mind started to churn. Katarina, then 12, decided to take matters into her own hands. In February 2014, she began working on the Dallas Pointe Shoe Recycling Project. Now, thanks to her work, the Dallas dance community can breathe easier knowing it’s doing its part for the environment: Instead of sending worn pointe shoes to the dump, dancers in the area can drop them off in recycling containers around town. From there, the shoes get picked up, broken down and eventually made into something else. going to be easy. But she had another driving factor. A longtime Girl Scout, she had been searching for the right project to submit for the Girl Scout Silver Award, the most prestigious prize for Scouts in sixth through eighth grades. And because the rules state that candidates must spend at least 50 hours on their projects, Katarina wanted to choose something related to her passion: dance. A pointe shoe recycling project seemed to be the perfect fit. Katarina set her plan in motion. 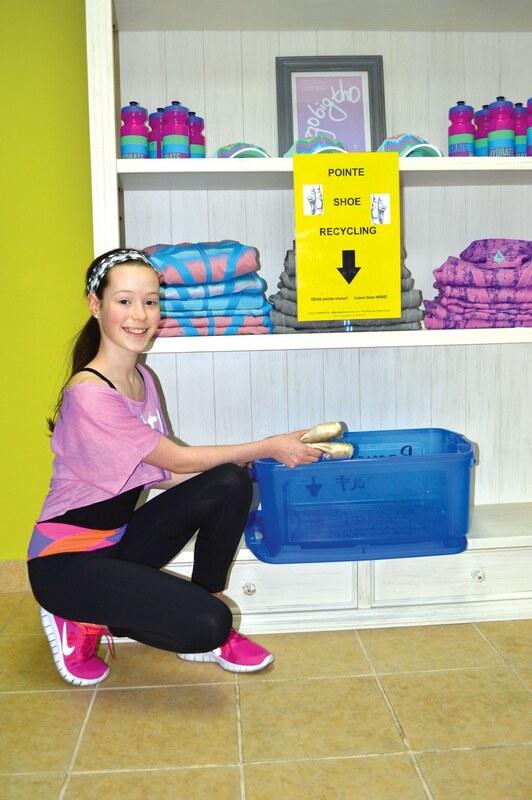 She placed pointe shoe collection containers—with posters and information sheets about pointe-shoe recycling—in three dancewear stores and two studios. “The containers are airtight, so the smell of old shoes won’t leak out,” she says. Once the containers are full, the store or studio owners take them to the recycling bin, empty the contents and bring the containers back to their businesses to reuse.